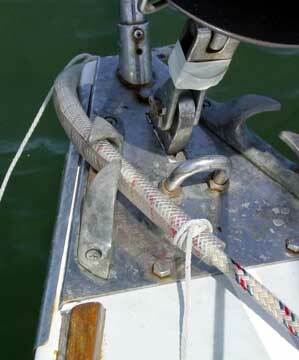 The friction between a rope (rode, sheet, halyard, etc) and another object will cause abrasion or chafe. 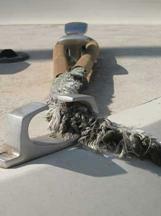 This is a very serious issue as it significantly weakens the rope until it parts  often with catastrophic results. Chafe can occur very quickly with rope rodes. We saw a boat break its rode when a raft up suddenly was subjected to choppy seas. The wind had turned against the current and the rode started to move against the metal toe rail. It was only a matter of minutes before all three boats in the raft-up started rapidly drifting towards a reef. In another instance with a raft up of multiple vessels of different descriptions, a catamaran tied between a sloop and a trawler started surging forward and back when the waves kicked up across a broad fetch. That motion against the motion of the sloop and trawler was like a saw blade. Luckily it was noticed and as we watched in horror the first of the ropes parted like a shot. Fortunately, we were able to disengage the raft-up quickly before any further damage occurred. 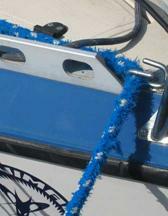 Any rope that touches edges or is exposed to objects that can rub (including other ropes) runs the risk of chafing through. Adequate protection against chafe is essential. 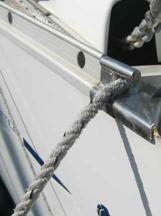 dock lines, an anchor line can chafe through just like this but very quickly. With a little attention to detail and some advance planning, protecting your rode or dock line from chafe is quite easy. Look for any place your rope may potentially come in contact with something else. At these places you need to add a chafe protector. We use reinforced plastic hose split along its length to allow us to place the chafe guard anywhere on the rode. We secure it to the rode with some line that we’ve tied through holes at either end of the length of hose. The reason for this is that we do not want the rope to move inside the hose, as this causes friction, which causes chafe. Instead we want the hose to move against the opposing object and be subjected to the abrasion. Appropriately sized plastic tubing is slit along one side, and holes are drilled in either end to accommodate lanyards. The tube is then slid over the rope and secured with the lanyards. You can also buy commercial chafe guards, usually made of similar materials or leather. Your chafe protector should be positioned so that it protects the rode anywhere it might rub against something. 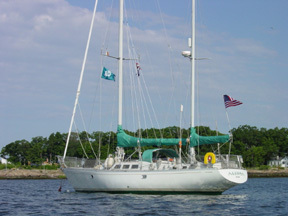 Note the protector extending beyond the bow of the boat. It must also be long enough to protect the rode when it stretches under load.